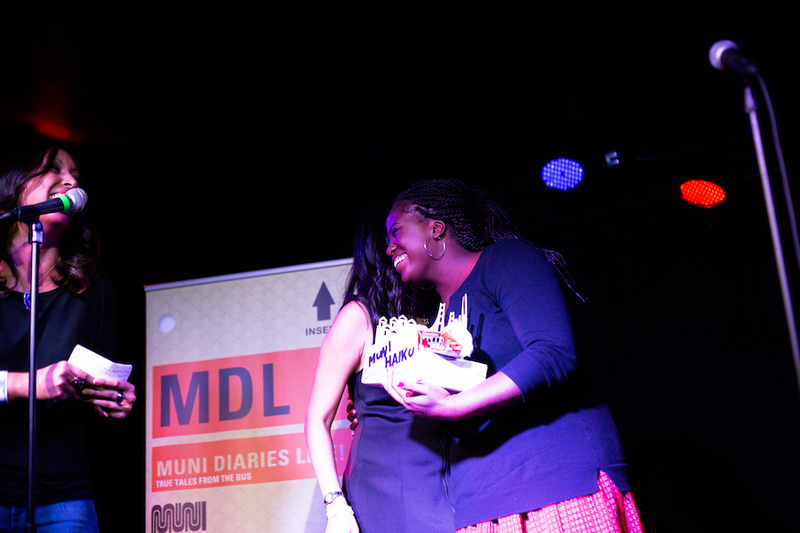 Twice a year, we take Muni Diaries out of the interwebs and into real life at Muni Diaries Live. 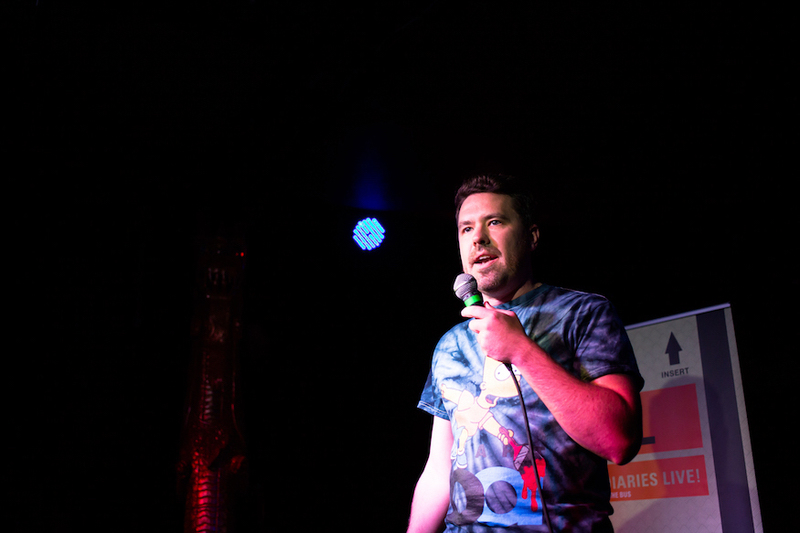 If those stories, told to a packed crowd at the Elbo Room last Saturday are any indication, Muni is still the spot to mine storytelling gold. 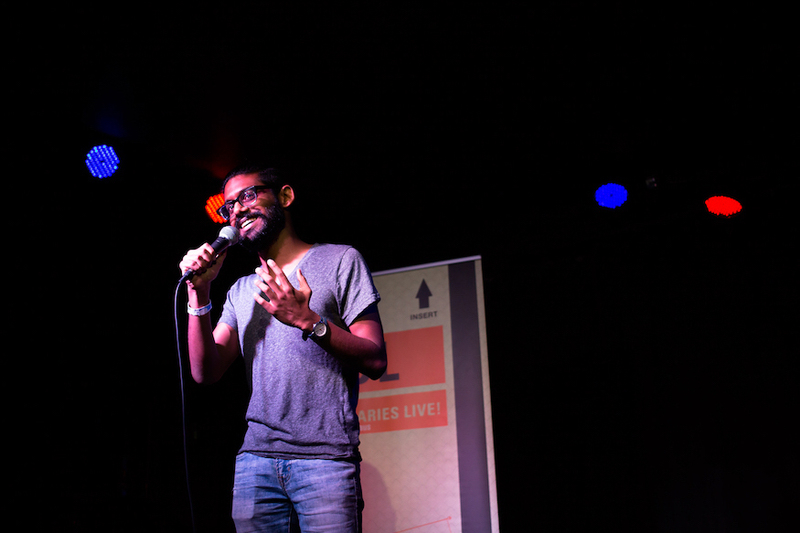 Comedian Tirumari Jothi, whose tale of an out-of-this-world conversation (rings of Saturn included) had the crowd in stitches. You can see him this Friday, Nov. 10th, and the Comix Experience Outpost on Ocean Avenue. Designer Steve Pepple works on making cities more livable at OpenGov, and he’s such an exemplary citizen that he spends his spare time volunteering at the San Francisco Transit Riders. Steve brought the audience a thoughtful story on why the BMW (BART, Muni, walk) experience is essential to urban living. If you were at our Haiku Battle at Clarion Alley for Litquake, you know that writer Alexandria Love can spin a tale. 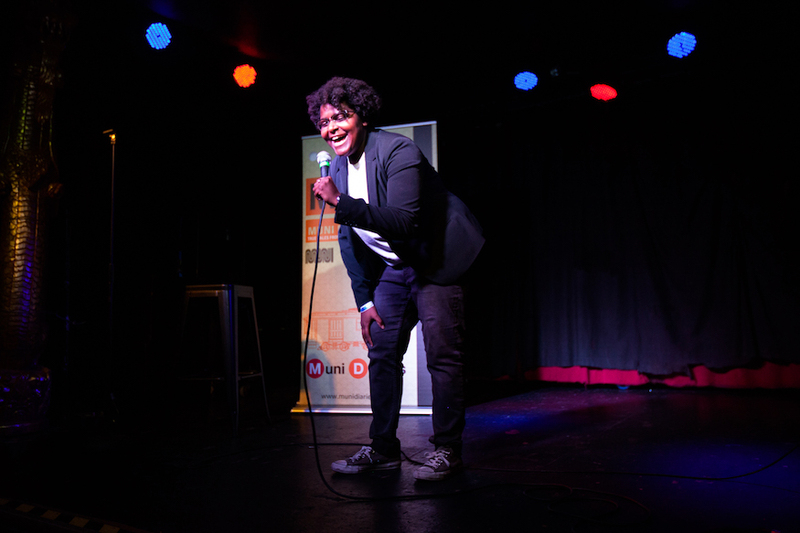 For the live show, she told us why riding public transit is preferable to driving—especially as you’re being broken up with. Newly minted storyteller Senait Hallermariam works at BAYCAT, a nonprofit media production studio that educates and employs young people in digital media. But it wasn’t long ago that she was struggling to make it in San Francisco. 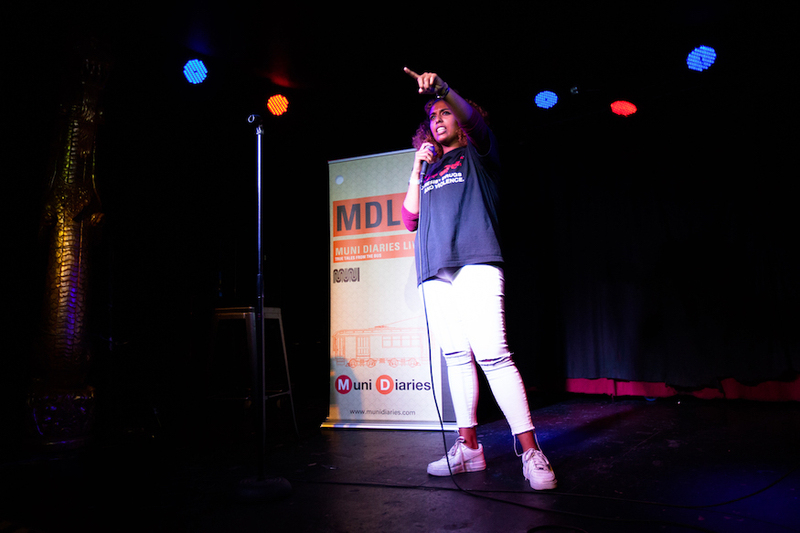 For her first Muni Diaries Live story, Senait told us about some unexpected humanity on the T and the value of paying it forward. Cue surprise tears. 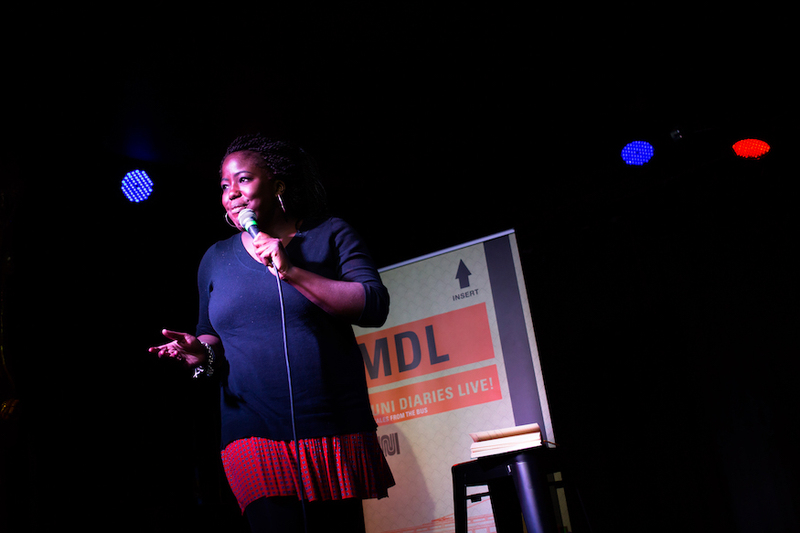 Comedian Dominique Gelin had the crowd (and us backstage) in different tears with a tale of getting picked up on BART. Pickup artists, beware: Blazer means no talking. 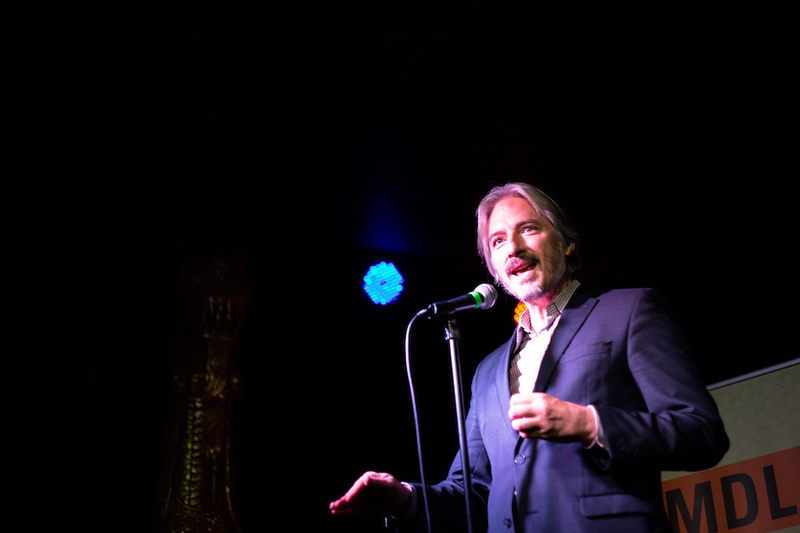 Those of you following the news know that Matt Gonzalez, chief attorney at the San Francisco Public Defender’s Office, has a packed schedule these days, which is why we were even more delighted to have him as a part of Muni Diaries Live. Matt took us back to the 2003 mayoral election—in which he was neck and neck with current Lt. Governor of California, Gavin Newsom, and why riding the bus as a politician in a highly contested race race means you gotta always keep one eye open. 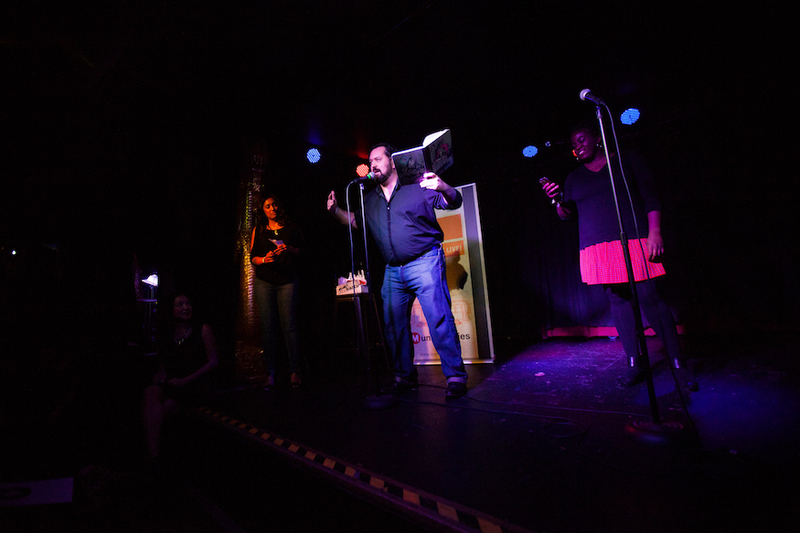 For this show’s Muni Haiku battle, poet Baruch Porras-Hernandez returned to defend his crown/cape against challenger Alexandria, who is also the reigning champ of the dirty haiku battle at Oakland’s Tourettes Without Regrets. The battle between these two poets was friendly at first, with a gradual on-ramp to Throwdown Town. 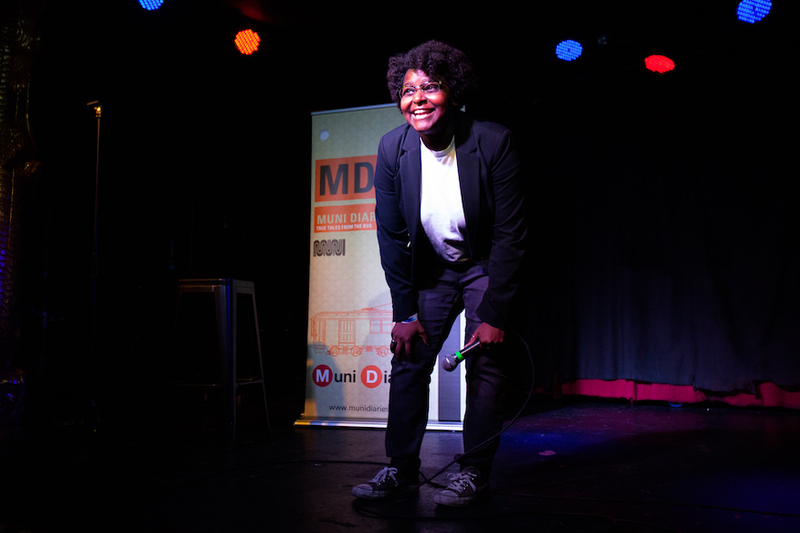 Baruch wowed the crowd with a haiku exchange between Muni and BART, but Alexandria had an ace poem that she was waiting to use for the last battle round. Who took home our homemade haiku trophy? With that last insult haiku, Alexandria is our new Muni Haiku champion! We were humbled by our amazing storytellers and everyone who showed up IRL to remind us what it means to live here in San Francisco. If you missed the show, subscribe to the Muni Diaries podcast to catch the latest live and in-studio stories. And as always: We can’t do this without you. Our submission inbox is always open for your Muni, BART, and only-in-SF stories.